FIRE-EARTH’s population model shows mass die-offs resulting from human impact on the planet and the planetary response to the anthropogenic harm could occur by early 2016. RANDOM. The mass die-offs would occur randomly. UNSTOPPABLE. Once triggered, the chain-reaction created by the dynamics of mass die offs would burst out of control. Social upheavals, regional conflicts and wars caused by mass migrations and scarcity of basic resources resulting from the combined effects of the above, as well as other mechanisms. China can drive life to extinction by simply continuing to grow. Total number of pollution sources now stands at 9 million, including 7.4 million industrial sources, 1 million in rural areas and 0.5 million from urban locations, according to preliminary estimates. Between 2007 and 2009, there were 5.9 million sources of pollution nationwide, with the industrial provinces of Guangdong, Jiangsu and Zhejiang topping the list, the National Bureau of Statistics reported. A 2 °C increase in global temperature above pre-industrial levels is considered a reasonable target for avoiding the most devastating impacts of anthropogenic climate change. In June 2015, sea surface temperature (SST) of the South China Sea (SCS) increased by 2 °C in response to the developing Pacific El Niño. On its own, this moderate, short-lived warming was unlikely to cause widespread damage to coral reefs in the region, and the coral reef “Bleaching Alert” alarm was not raised. However, on Dongsha Atoll, in the northern SCS, unusually weak winds created low-flow conditions that amplified the 2 °C basin-scale anomaly. Water temperatures on the reef flat, normally indistinguishable from open-ocean SST, exceeded 6 °C above normal summertime levels. Mass coral bleaching quickly ensued, killing 40% of the resident coral community in an event unprecedented in at least the past 40 years. Our findings highlight the risks of 2 °C ocean warming to coral reef ecosystems when global and local processes align to drive intense heating, with devastating consequences. More than 70 percent of Japan’s largest coral reef in the Sekiseishoko area, located southeast of the archipelago, died in 2016 due to a rise in water temperatures, according to a study by Japan’s Ministry of Environment. A ministry official said the results showed accelerated coral bleaching was taking place — due chiefly to rising ocean temperatures. The bleaching at Sekiseishoko worsened between June and September last year because ocean temperatures were 1 to 2 degrees Celsius higher than normal, exceeding 30 C.
The latest figure shows a significant jump with respect to that registered between September and October, when 97 percent of the corals had undergone bleaching and 56 percent had died. According to the survey, 91.4 percent of the coral in the surveyed locations is at least partly bleached. I read your fire earth posts and agree we are on a terrible trajectory with huge momentum just like a Tsunami, but there is hope. In the atmosphere of a natural limbic resonance and our collective consciousness potential there is a tremendous flowing power of hope, life and ascension among us. We must know facts and truth but also deal among us in nourishing magical words of positive manifestation, encouragement and faith. Lets take all we know and are concerned about and sit silently in the nature and throw the concerns into the wind, speaking out aloud of what we know, like offering clay pigeon targets for the divine attention and surrender our concerns in that moment to the power of life that is so keen to help us and watch the magic unfold. You will feel lighter and others will be touched by your efforts as we all work in our own way for a better future. Let us polarise ourselves toward truth, hope and enlightenment and help others rise up out of smallness. Team effort! Do you have a big “party” planned for the final countdown? We’re the “grand jury,” as it were, not the judge. While we do influence the “planning,” we don’t fully control the process. Some might consider a viral nightmare like mass “microcephaly” or global “sterilization,” among other thoughts, a fitting finale to the verminous bipod existence; however, there’s general consensus that this is not just about retaliation and punishment. Ultimately, the epilogue depends on how the world is perceived by the viewers: What’s the worst possible endgame for each player? Massive amounts of man made radiation continuously pouring into the largest ocean on the planet, causing mutations in humans, leading to a shrinking of our ability to think… Eventually we become so simple that only the basics are all we can manage to deal with. Food, mating, finding a cave when it rains. The “meek” shall inherit the earth. We won’t invite them to the prom. It includes movement, birth, life, transformation, death, chaos, … and often re-birth. Our literature describes the flow component as HIGHLY irregular, patchy and full of holes. Everything in this universe has a lifespan! Saddened to hear of your plight, but the energy dinosaurs have been burning the planet, one way or another, for quite sometime. NO human should have to breath in hazardous air. It just doesn’t make any sense; and certainly NO human should put up with this kind of situation. Everyone should be enraged. 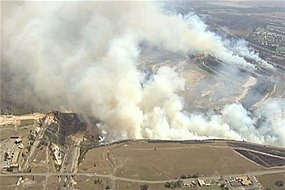 The last we heard, authorities were planning to evacuate Morwell, Is that still on the slate? Why was May 15 2011 the turning point? And now, with the extent of the severity, of the radioactive material, coming from the three reactors at Fukishima, polluting the Northern Hemisphere, has the percentages changed? The date is statistical and model driven, bearing in mind that the COUNTDOWN is symbolic. Your premises are totally false. However, the moderators are too busy to reply in detail. Your hostile intentions are noted. Contents of both your comments have been removed by a Moderator. The models are currently unpublished.